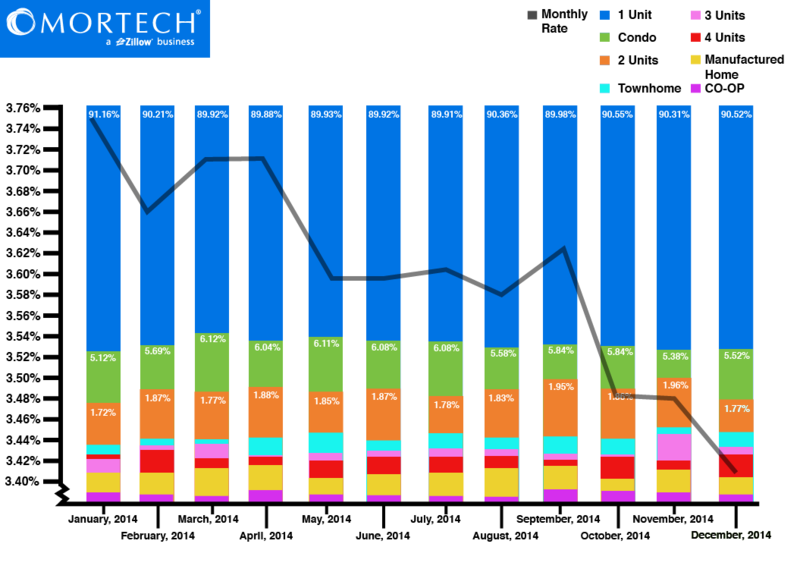 Two weeks ago we took a look at the rate of purchasing vs. refinancing in relation to the monthly rate in 2014. So, this week, we decided to take a look now at the varying numbers of average quotes per property type in 2014 according to statistics compiled internally within Marksman. Beginning in January, which was also the month with the highest rate of any out of the year, every quote average was at its lowest point in the year. This makes sense, when looking at January’s rate compared to December’s, as there was a .34 difference, however the rate didn’t steadily decrease, as there are 5 different periods in which the monthly rate increased rather than decreased. As for popularity, single unit, condo, and double unit quotes had a much higher amount than the other properties, with single unit having the most by a pretty wide margin. However, all property types never dropped at any point, and all finished the year with a net positive in average quotes, with single unit and townhomes having relatively large increases in the final month of the year. As these property quotes come in, it’s important to have the most accurate rates to push out to customers. Find out how Marksman can automatically push your rates to multiple investors, and give your customers fast, accurate rates. To schedule a free, consultative demo, just fill out this short form.